Roughly crush 250g (9oz) cherry tomatoes and toss with 4 tbsp good olive oil, 12 stoned kalamata olives, 2 tsp small capers, 4 finely chopped anchovy fillets and some seasoning. 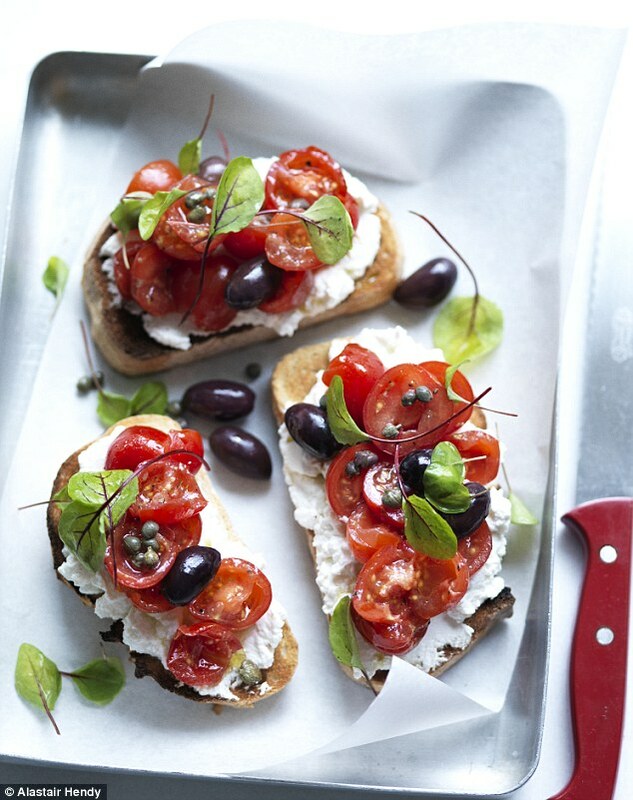 Toast 4 slices of good sourdough bread, dress with olive oil and a little sea salt then spread each slice thickly with 2 tbsp ricotta. Pile on the tomato mixture, top with sprigs of summer herbs or peppery leaves (such as basil, rocket and baby chard) and devour! 1. Preheat grill to hot. 2. Place the first measure of olive oil and 2 cloves of garlic in a small pot. Warm through until garlic is just starting to cook. Add tomatoes and sugar, then cook for a few minutes until softened and saucy. Season with salt and pepper. 3. Heat second measure of oil in a frying pan, add remaining clove of garlic, then the prawns. Toss in the pan until just cooked (3 or 4 minutes). 4. 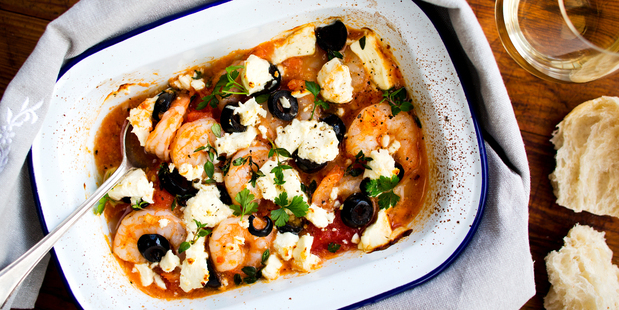 Place prawns in an ovenproof dish. Sprinkle on olives, crumble over the feta and thyme sprigs. Season with black pepper. 5. Place dish under grill until feta starts to melt and brown. Serve hot with crusty bread. There is nothing quite comparable to whole grilled fish with a warm seasonal salad on a summer evening. My Barbecued Red Mullet with Warm Fennel Salad and Oranges is exactly that. These fish have a distinctive flavor that contrasts perfectly the acidic citrus in this dish. Small red mullet show up at fancier fish stores in the United States and everywhere in the Mediterranean. Red mullet is sold whole and in fillets, both fresh and frozen. Whole fish are usually sold unprepared and thus require trimming, scaling and gutting. Red mullet is best bought from May to November, outside of spawning season, to protect stocks. If mullet is unavailable on those off months, use small snapper or even ocean perch for a similarly delicate substitution. Nyons olives are one of my all-time favorite varieties to toss in salads or cook in pastas, or even to blend into a pesto, which is a favorite of my sons. These tiny, jet-black olives from southern France have a salty, mild bitterness whether dry-cured or packed in oil. If you’re an olive novice, Nyons will romance you right from the first bite. As an alternative, arbequina olives are perfectly crisp, tiny and slightly bitter Spanish olives that pair nicely with the warmed fennel in this recipe. Just as red mullet is best bought from May to November, oranges have a peak season as well. I really enjoy Valencia oranges in a summer salad because they are medium sized and have few seeds. And you really get bang for your buck as opposed to smaller citrus fruits like tangerines and nectarines that are filled with inedible seeds. While these are delicious substitutes in winter months, Valencia oranges are perfectly ripe at the moment and you’ll get a lot of juice out of this variety. This dish combines elements from three of my favorite parts of the world. Mediterranean red mullet with French olives and Valencia oranges make for the perfect summer evening meal. We recommend Chalkidiki olives to be integrated to the recipe above. Try Inolivia! Mario Batali is the award-winning chef behind twenty-four restaurants including Eataly, DelPosto, and his flagship Greenwich Village enoteca, Babbo. In this column, Mario answers questions submitted via social media and by people he encounters daily in Downtown Manhattan. Keep asking! Whether you celebrate the upcoming Easter or simply enjoy a nice weekend at home, there are chances that apart from “proper” meals, you also plan small snacks. If you intend to buy seasoned olives, my advice is: don’t! Olive seasoning is quick, effortless and, frankly the results are incomparably better. The most popular, vaguely Mediterranean ingredients, such as thyme or garlic, are the safest and always satisfying choice. Last Saturday however I went crazy and, for the first time, spiced up my olives in what I would call “Korean style”. It must sound like another fusion idea doomed to fail, but I was pleasantly surprised to learn that sweet and hot flavours with a strong sesame touch proved fantastic – though still astonishing – company for olives. Certainly it’s not a crowd-pleasing snack, but if you are a fellow Korean food fan, you should try this unusual combination; you might fall in love with it just the way I did. TIPS: Seasoned olives improve after several hours in the fridge, but you can serve them straight away. They keep for several days in the fridge, but I cannot guarantee a week (I always finish them in less than a week). Combine everything in a bowl. Cover and put into the fridge for 15 minutes (or several days). If you are in a hurry you can serve it straight away. After a lifetime of drinking martinis, Jared Brown shares the secret to a perfect cocktail. Perched over the bar at Kettner’s in London’s Soho, Jared Brown apologises for sipping his Martini before GQ even has a chance to pose a question. “Forgive me for not waiting, but as Harry Craddock once said, ‘A drink should be drunk while it’s still laughing at you! '” As a cocktail historian, New Yorker Brown has been studying the perfect Martini for over two decades – during which time he’s published 30 books on the art of mixing drinks – but he is still fascinated by the endless variants on the components. “It is the simplest and yet the most challenging of drinks to balance perfectly,” he explains. “Anyone in this world can mix a good Martini. Few can mix a great one”. Currently working as master distiller at London gin company Sipsmith, Brown has recently created a list of 100 Martinis for a drinks showcase at Kettner’s. GQ caught up with Brown to discuss cocktail mistakes, fictional favourites and how to cope with a monstrous Martini hangover. GQ: What’s the cardinal sin of Martini making? Jared Brown: The first thing that can go wrong is the use of cheap gin and vermouth. Because it is such a pure drink and there’s no juice or soda to mask the alcohol’s flavour, what you mix with is crucial. Also you couldn’t do anything worse than pouring a Martini into a warm glass. Why would you go to so much effort to perfectly chill the drink, and then warm it back up before it hits your lips? Other than the English, who makes a really good Martini? One of the best bars in the world for martinis is in fact Bar High Five, located in the Ginza district of Tokyo. You can generally find an amazing martini at Barcelona’s Boadas too. Other than Kettners, which other bars would you recommend? In London, I would definitely recommend Duke’s in Mayfair; The Savoy, because their head bartender, Erik Lorincz has more than inherited the great Harry Craddock‘s post and studies his classic work extensively; and because I must, The Artesian at the Langham. Out of the 100 variations, what are your personal picks? I absolutely love the original Martini, which so few people have actually tasted. Everyone thinks that it was originally created with dry vermouth, but it wasn’t. The original martini was made with equal parts gin and sweet or Italian vermouth, a dash of orange bitters and often a drop of absinthe. Second would have to be Julia Child’s reverse Martini, which is mixed with three and a half parts sweet vermouth to one part gin in a wine goblet that’s filled with ice and topped with a lemon twist. Lastly, a dry gin Martini with olives. When I was in school and on a very low budget, there were days when my lunch would involve going into a bar, ordering a Martini and a glass of olives. I would pour the drink over the olives and that was my meal. 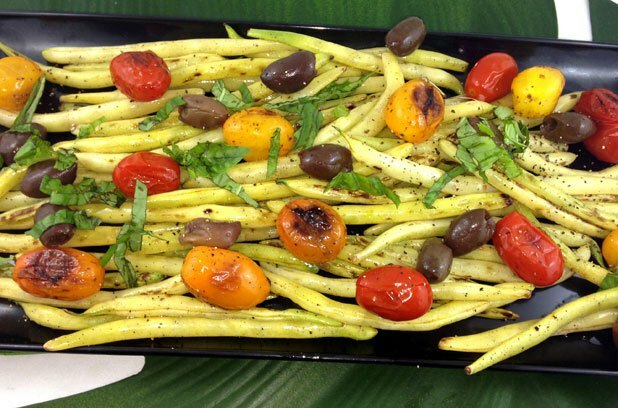 A very nicely marinated olive salad. What do you like served with your Martini food wise? The Martini is a wonderfully versatile drink to pair with food and honestly for me, cocktail pairing is easier than wine pairing. With wine, the best magic often happens several years prior and hopefully somewhere in France. With a cocktail, the magic happens here and now. They can be tailored, balanced or tweaked with any different additions or garnishes. I once designed one specifically to go with steak, which featured gin, vermouth, fresh tomato, Tabasco sauce and garnished with a blue cheese-stuffed cherry tomato. It was really quite phenomenal. What trend in cocktails needs to die out? Bartenders telling customers how they should have their drink. The rise in consumer sophistication has allowed for better interactions and it’s wonderful to see when customers give instructions that are respected. By all means, ask for a shaken Martini if you want one. Other than Bond, what’s your favourite cultural reference to Martinis? What should no man ever order at a bar? I believe that in a good bar, anything can be as amazing as the person behind it. Unless you really need a beer or you’re desperate for a glass of wine, have a mixed drink because you’re missing the opportunity to take advantage of the great talents of many bartenders. Leave it up to them. Ask them what they are working with and give them some direction. There is no wrong order – when you let a good bartender build on their inspirations, you get that much more love and care in the drink. Firstly, always have a good-sized glass of water for every cocktail you have. Secondly, have a vitamin before bed to replace what has been depleted. Lastly, if you really think you’ve had too much, then purging might just be the answer. In fact you will be more functional in the morning if you take that drastic step. I absolutely do not recommend a “hair of the dog”, either. It simply postpones your hangover at a great cost. Not only are you putting it off, but you’re also banking it! This is a nice sweet, salty salad with a bit of a nutty undertone, thanks to the walnut oil. No dressing required. Just spoon the chickpea mixture over top of fresh, bright baby greens, and enjoy! 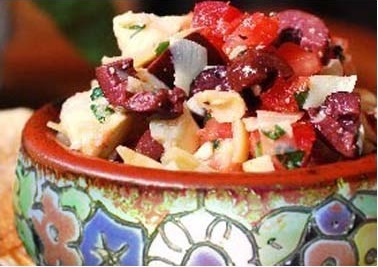 In a medium bowl, combine the chickpeas, raisins, red pepper, olives, parsley and scallions. Pour the olive oil over top and season with the salt and pepper. Stir to combine. Refrigerate for 1 hour. Divide the greens among 4 bowls. Top with the chickpea salad. We have the Greeks to thank for so much of our modern day society. They paved the way for great philosophical minds to keep pushing us forward intellectually. They gave us the Olympic Games, and a desire to strive for athletic excellence. And, well, then there’s democracy. Clearly, we owe a lot of who we are to Greece. We’re thankful for all of it, but most of all, we’re thankful for the feta. The Greeks have singlehandedly shaped our modern society, and they have also — and just as importantly — shaped a way of eating that no country can rival. 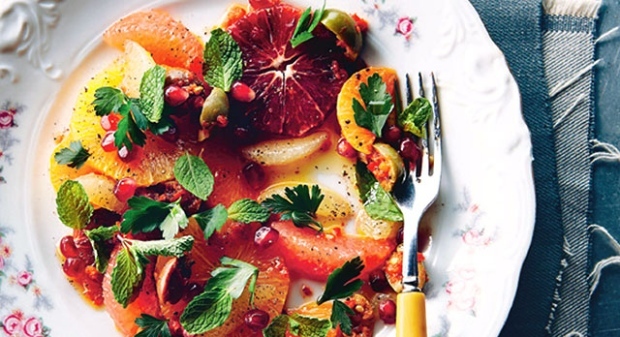 Not only is their cuisine swimming in fruity olive oil, drowned in red wine and full of mezedes, but it’s also a diet that nutritionists across the board tout as the way to eat healthy. While we all try to eat like this, and happily so, the Greeks do it best. It’s just their way of living, which explains why they’re so much better at life than the rest of us. 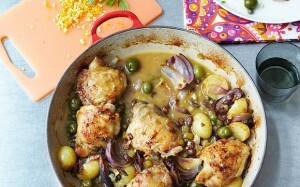 Cont…..
A recipe by Mary Berry: This is a great way to feed the family as the chicken and veg are all cooked in one very large tray in the oven. It takes only minutes to put everything together then it sits in the oven for under an hour with no fussy finishing off to do and only one pan to wash up. The recipe allows one chicken thigh and one drumstick per person, but use less if you are not such big eaters. I love stuffed olives, but use plain green or black ones if you prefer. The preserved lemons really give a lovely citrus tang to the dish and are well worth using but if you can’t find them use one sliced lemon instead. Place the potatoes in a large roasting tin with 2 tablespoons of the oil. Toss well to coat them. Add the onion, garlic, bacon and chicken pieces and toss together. Add the lemons to the roasting tin. Season everything well and sprinkle with the paprika. Roast for 40 minutes. In a bowl, toss the courgettes in the remaining tablespoon of oil and season with salt and pepper, then poke them in among the chicken and scatter the olives over the top. Return to the oven for a further 20 minutes, until the chicken and vegetables are golden brown and tender. Mary’s wise words Don’t overcrowd the roasting tin. You need everything to be in a single layer or it will not cook evenly – divide between 2 tins if necessary. Preserved lemons can usually be bought in jars in the speciality section of the supermarket. Traditionally from Morocco, the lemons are preserved in salt water and are beautifully soft and citrussy. Use them to flavour tagines and chicken or pork dishes. They will keep in the jar in the fridge for 1 month, or you can freeze them in a freezerproof container for up to 3 months.